July 21 was horribly horribly hot, but the First State Symphonic Band was cheerfully rehearsing in the giant band shell of Bellevue State Park as I arrived. Conductor Jonathan Wittman had a huge rag on a music stand in front of him so he could wipe his brow between numbers, but the band played on. Most of the repertoire consisted of familiar marches, but an interesting experiment was the Alfred Reed Armenian Dances, a complex medley of tunes reminiscent of a Turkish bazaar. You could hear snake charmer themes and all sorts of exotic melodies as the band toured through the exotic five/eight rhythms. Another fun surprise was a band piece by Joe Eigenbrot, a Bethlehem PA native and saxophonist in the band. His piece showed the Polish and German heritage reflected in the peoples and spirit of his native area. Kids danced in front of the band, staff put on a bubble machine, dogs barked, and people ate dinner, wandered and enjoyed the informal atmosphere of a park concert. The concerts are free, but there is a park charge of $3.00 if you do not have a State Park Sticker for your car. Outdoors under the rustling tress behind Rockwood Mansion, not even the occasional far-off train whistle will break you from the feeling of being transported to another time. More than almost anything, watching live Shakespeare done well, as it's done at the Delaware Shakespeare Festival, will do that. The play on this night was A Winter's Tale, one of Shakespeare's lesser-known and late-career plays -- and what a ride it is. Jealousy and devotion, birth and death, love and redemption -- these themes will always remain fresh. As Leontes, the King of Sicilia who becomes overwhelmingly convinced that his wife, Hermione, is having an affair, Erik Mathew gives an emotional performance. Janice Rowland's Hermione is full of grace. Adam Altman and Molly Cahill Govern stand out as the devoted advisor and gentlewoman to the King and Queen, respectively. Erik Mathew as Leontes, Janice Rowland as Hermione and Rueben Mitchell as Polixenes. The second act, taking place 16 years after the first, is lighter, more humorous and more romantic than the first. Jake Blouch's Autolycus a singing rogue and small-time criminal, is a show stealer, as is David Strattan White as the shepherd's son, the play's clown character. We meet the grown daughter (Isa St. Clair) of Leontes and Hermione, who has fallen in love with the son of the king her mother was accused of being unfaithful with, Florizel (Sean Bradley). His father, played more comically in the second act by Rueben Mitchell, forbids them to marry. Love will prevail -- or so we hope, as we're reminded that the doomed Hermione and Leontes were once deeply in love, too. The solid DelShakes cast, including a handful of college apprentices, did a great job of entertaining and making Shakespeare accessible. One thing I do know: If it's poorly acted, a modern audience will have a hard time following it. I had never seen or read A Winter's Tale before, and the actors delivered the prose impeccably -- I wasn't lost at any time during the performance. 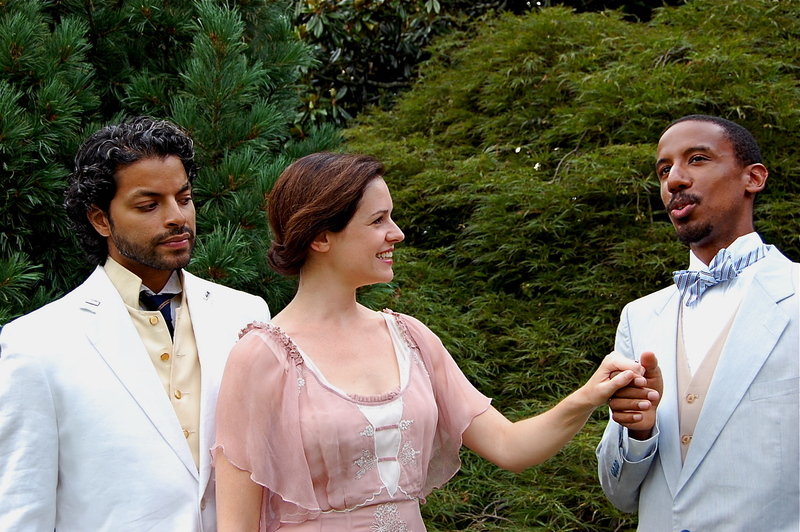 A Winter's Tale Runs through July 30. 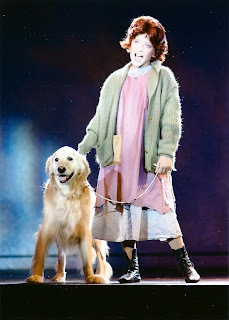 Being a female kid of the '70s, I was an "Annie" fiend in elementary school, as was every other girl I knew. Sticker collections and Annie, that's all that mattered, as well as Pink Floyd's "The Wall," which we didn't necessarily have to like, but it was there, and it seemed to be on our side. "Annie," with its defiance, paired with its belief that a little kid could potentially change not just her own life, but the world, was definitely on our side. I took my 7-year-old niece, Sophie, to the opening night of Annie at the New Candlelight Theatre. I don't know if the show has the same presence for young girls it had 30 years ago, but I do know that she is hooked, playing the same old record we listened to countless times. (Fun fact: three regulars of the much-missed "Al Alberts' Showcase" were cast in the original Broadway cast of Annie, including the original Broadway Annie herself, Andrea McCardle. Chris Alberts, the son of the legendary Al and Stella Alberts, is the New Candlelight Theatre's Artistic Director.) So, for me, at least, this nostalgic show was a must-see. The NCT production lives up to the high standards the theater has set this season with shows like Cats and The Full Monty. As Annie, Jamieson O'Brien lights up the stage as any Annie should, and the rest of the orphans -- Rebecca Smith, Katie Loftus, Gueneviere Sherlaw, Jordan O'Brien, Kayla Brock and the scene-stealing Nicole Hemphill -- are a delight. Geri Weagraff's Ms. Hannigan is both sleazy and surprisingly sympathetic, though not to the point where you feel bad when she gets her comeuppance. Rooster and Lily, characters who have to own their scenes (as a point of reference for those not familiar with the play, they were played by Tim Curry and Bernadette Peters, respectively, in the movie version) are played solidly by Dewey Oriente and mega-talented NCT regular Lindsay Mauck. The role of Daddy Warbucks is played by another NCT regular, Patrick O'Hara, who brought both the required conservative staunchness and warmth to the role. You have to care about whether Annie and Warbucks become father and daughter for the play to work, and O'Hara does make you care. Rounding out the cast is the lovely Megan Pisors as Grace, Dave Snyder as FDR, Andre Dion Willis as the butler Drake, and an incredibly strong ensemble. 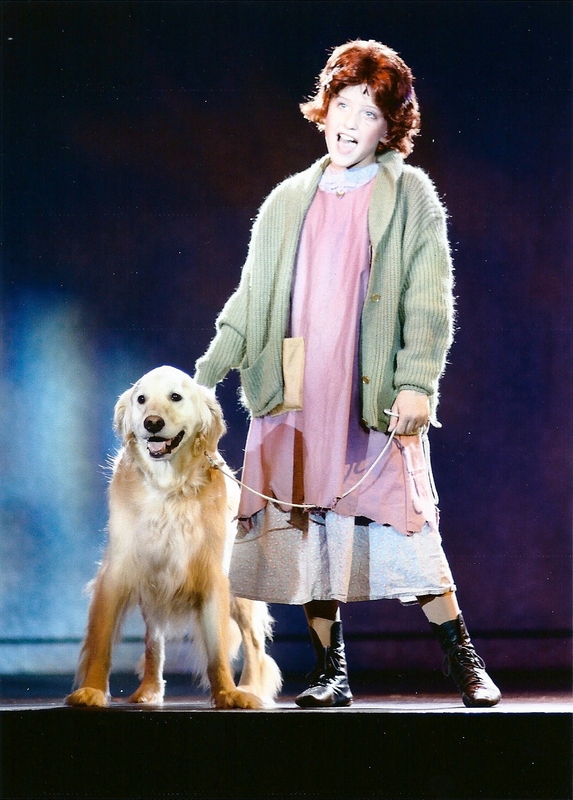 Whether you want to revisit your youth or introduce a great musical to the next generation, Annie fits the bill. The show runs through August 21, and, as always, the ticket price includes a buffet dinner; a cash bar featuring specialty Annie-themed drinks, specialty desserts and a nightly 50/50 raffle are extra. The first stop was at the Delaware Center for the Contemporary Arts where very few studios were open. 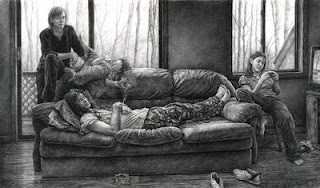 The Annual Members’ Juried Exhibition was still worth the visit. My favorite of the Duets (partnered works by each artist) was a large object photographed into the sun by John Schlesinger of Philadelphia. I had not consciously looked for its partnered work and it took me a long time to realize that a lone Styrofoam cup with holes burned in microcrystalline wax was the ‘large object’. Perspective made the cup look gigantic in the photograph and created the intriguing pairing. The charcoal drawings by Edgar Jerins (top) in the Beckler Family Members’ Gallery were captivating. 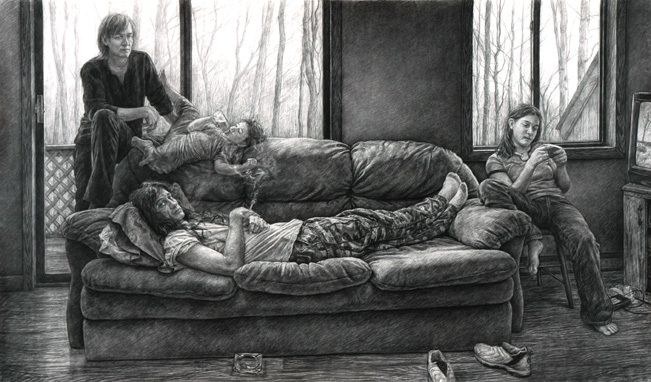 Jerins’ drawings are rich, real and full of detail and perspective that make you feel you are in the picture with the people he portrays. You can almost hear some of them sigh. The artists in residence, Jung-A Woo and Hoyun Son, who had each studied at the Chicago Art Institute, presented their plans for a five-week project in residence with the DCCA, the Latin American Cultural Center, and the Delaware Horticultural Center. Their Movable Feast – a study in food and culture – will explore how food affects culture and art. They will show the final product at the August Art Loop. 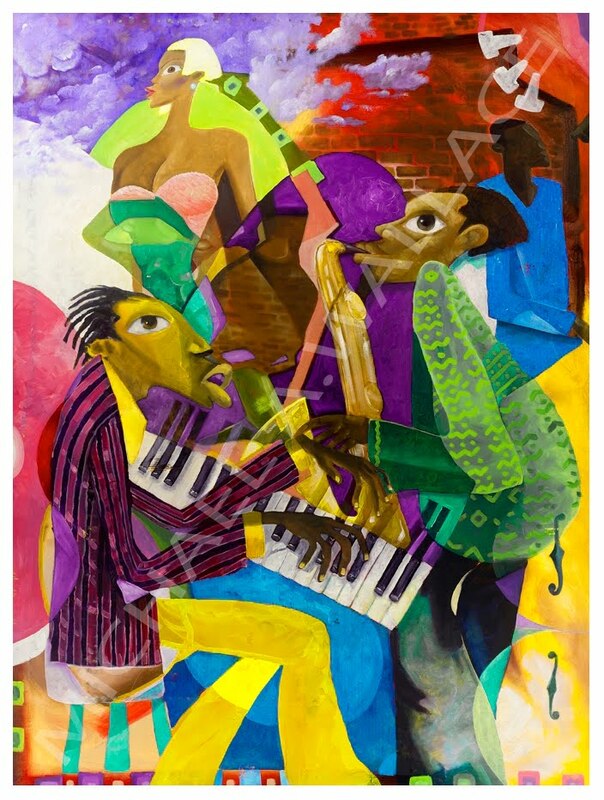 The Louis L Redding Gallery had lively and imaginative portrayals of African American life and music by Michael Angelo Wallace, a native of Philadelphia. With vivid colors, Wallace goes from almost cartoon-like images of church to Biblical exegeses and back to cubist and surreal images doubling as outlines musical instruments (Ornithology, lower image). Top that off with cool jazz in the background and delicious snacks by Copper Café and my hat goes off to Jeni Barton for planning a great evening.